This is a mat to put near the door. It will catch lots of outdoor dirt before it makes its way all over the house. 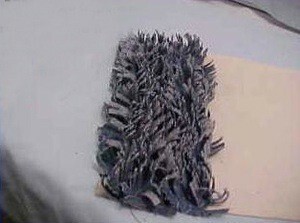 This mat is made from recycled blue jeans, and makes use of very small scraps. You can make the base whatever size you want your mat to be. Whenever your kids outgrow their denim jeans, save them for making bags from the legs. Cut off the legs at the crotch, turn inside out and hem the unfinished edge. Now you have a nice long tube-bag for tent poles, beach umbrella storage, etc. Save up and ask friends and family for old jeans. Make a throw or bed blanket! Not to long ago my grand daughter went through a growth spurt and she asked me to turn her skinny jeans into shorts. Using Cut Off Pant Legs. My 7 year old is a little larger than average around his waist, so I have to buy pants that are to long for him in order to get ones that will fit him around his waist, and end up cutting and hemming them for a better fit. . . When my children were growing up, I cut the legs off their bluejeans and made shorts for the summer months. I saved the legs and made several things from them. I remember one being a cover for the dog bed and another a tennis racket cover. I made these for my pre-teen. I took Rice a Roni boxes with the top half cut off. I used old jeans and glued the jean material around the boxes. I used Sharpie markers to write "Live, Laugh, Love." What can be made with old jeans? 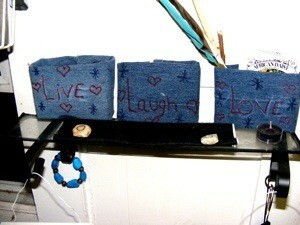 Pictured are two potholders that I made from a pair of my husband's old jeans. I cut the legs off two more pair of his jeans and will be able to make two kitchen hot mats. You can use them to make knee, elbow and/or pocket patches as well as for some arts and crafts projects. Instead of sewing use fabric glue or a glue gun. Well it depends on how small your dogs are but your pets can use them as covers or just to run around and play tug-o-war with. Or you can use them to clean around. Hope this helps you out ! You can make quilts, handbags, pocketbooks, belts, or covering a small lamp shades. Sew the narrowest edges together with strong thread, and firmly stitch a loop of cord to each side of the other end, to make a bottle carrier for picnics, parties or just for giving a bottle as a gift. I saved my off-cuts and they have been invaluable for patching the knees of hubby's work jeans over the years. Stitch or staple one end together, insert a glass jar, turn down a cuff at the top, decorate with red, white, and blue ribbons tied in a bow around the neck of the jar, and you have a cute flower vase. Sew one end shut, then stuff for a car travel pillow. After it's stuffed, sew the other end shut. They are sturdy, wash well and fit nicely behind your neck. I still have mine from when I was a kid. What can I do with denim scraps? Question: How Do I Make Fringe from Old Jeans? I am looking for how to make fringe out of old blue jeans. 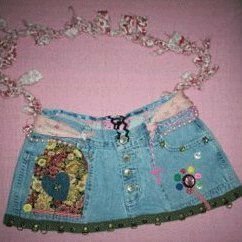 This is a guide about making a jeans purse. Jeans have long been an often used recycled material for a wide variety of crafts. 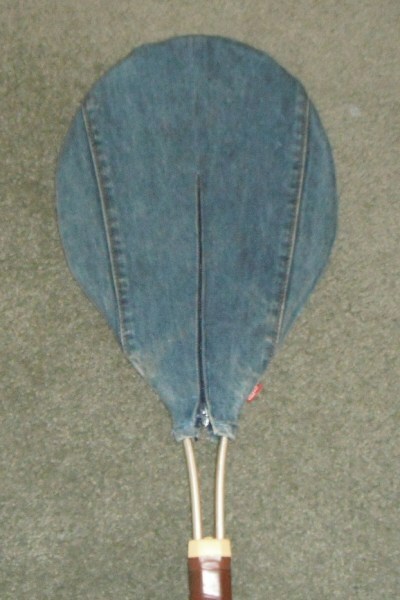 One popular use is to cut and restitch into a durable jeans purse.